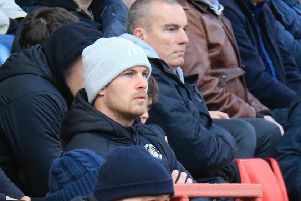 Town skipper Alan Sheehan has confirmed he is hoping to stay at Kenilworth Road for a crack at League One next season. The 31-year-old, who has made 105 appearances for the club since signing in January 2016, is out of contract at the end of the current campaign. When asked if wanted to remain with the Hatters and whether he felt Luton had a squad who could compete at the next level, Sheehan said: “Yes, of course (I’d like to stay). “We’ll have to find out next year (whether Luton can do well). “We’ll have a good look at it, I’m sure the manager and Mick (Harford) and Gary (Sweet) and everybody are already planning ahead. “We’ve played teams already, Portsmouth (in the FA Cup), little benchmarks, so we’re not afraid of anybody. Let’s just plan and go from there in the summer, and then we’ll give it a good crack next year. It has been a superb season for Sheehan, as he was named in both the EFL and PFA League Two Teams of the Season, plus the Supporters Player of the Year and Internet Player of the Season as well. He was quick to play down his own achievements, adding: “On a personal note, I’m delighted, but the PFA and the EFL, there could have been up to 10 Luton Town players in my opinion.